A french omelet is simple, elegant but requires a gentle touch. Mastering the French omelet...how can something that looks so simple require all this prep advice? Ah well, it's worth it when the perfect omelet graces the plate. First, because an omelet takes only a few minutes to make, be sure your ingredients are all ready. And if you're cooking for guests, make sure they're seated and ready to eat. When you beat the eggs for this omelet, just beat gently until the whites and the yolks are incorporated. You don't want to get them all frothy. This omelet is best cooked in a 6 to 8-inch non-stick sloped sided pan. First, pre-heat the oven to 200F. This is where you'll hold the cooked omelets on individual plates while the others cook. You'll need 2 large eggs per person which yields just a little less than a 1/4 cup. Beat them all together and then pour that much into the prepared pan for each omelet. Here's the basic omelet recipe and some ideas for complementary fillings. Beat the eggs with the seasonings until the whites and yolks are blended. Don't overwork it. In a 6 to 8-inch omelet pan, melt the butter over medium-high heat. Tilt the pan to swish the butter around. Just when the foam is subsiding pour in the eggs. Now, shake the pan back and forth and with a fork in the other hand stir the eggs without touching bottom. One the bottom has set, you can add the filling (optional). Simply put the filling down the middle in a line. Now roll one edge of the omelet toward the center. A fork will be the best tool. Simply tilt the pan a bit so that the back edge of the pan acts as a brace. Is the omelet browned the way you like? If not, then leave it on a little longer. When the omelet is ready, simply tilt the omelet against the pan again so that it rolls onto itself. Then it simply slips onto the plate seam side down. 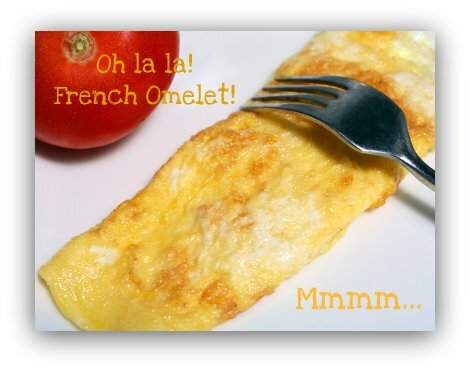 Return from our French Omelet Page to our Omelet Recipes Tips page. Return to our Low Carb Egg Recipes Page.